David Benyamine took down the PartyPoker Premier League IV championship a short while ago, outlasting players such as Luke Schwartz and Daniel Negreanu to claim the title and $400,000 first place prize money. Heading into the seventh (and final) day of play on Friday, four of the six final table spots had been secured. Thanks to their finishes in preliminary heats, Phil Laak, David Benyamine, Luke Schwartz and Giovanni Safina were all guaranteed spots at the final table. The other spots would be claimed by two of the four following names: Daniel Negreanu, J.C. Tran, Roland De Wolfe and Ian Frazer. Daniel Negreanu would square off against J.C. Tran in a best of three heads up match, while Ronald De Wolfe would play against Ian Frazer. The winners of these matches would be through to the final table, while the losers would be sent to the rail. In the end, Daniel Negreanu defeated J.C. Tran to secure his spot at the final table, while Roland De Wolfe was able to dispatch of Ian Frazer. 6th Place, Phil Laak, $50,000. After dominating in the preliminary heats, Phil Laak was the first player to be sent to the rail at the final table. Laak and Benyamine got into a pre-flop raising war. Benyamine pushed, sending Laak deep into the tank before finally making the call. Benyamine showed A-K offsuit, while Laak showed pocket Tens. The board came Qd-4s-2d-Ah-5d, sending Laak to the rail in 6th place. 5th Place, Roland De Wolfe, $70,000. De Wolfe moved all-in pre-flop over top of a raise from Daniel Negreanu. Negreanu called, showing pocket Nines, while De Wolfe flipped over Ad-Jh. 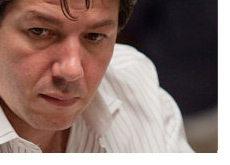 The flop brought a Nine, giving Negreanu a set, and De Wolfe was sent to the rail in fifth place. 4th Place, Daniel Negreanu, $80,000. After losing most of his stack to Luke Schwartz during an earlier confrontation, Negreanu was sent to the rail by David Benyamine a short while later. Negreanu and Benyamine got their stacks into the middle after a flop of Kc-9c-Qd, with Negreanu holding Qc-5c and Benyamine holding Kd-9s. The turn brought another King, filling Benyamine up and leaving Negreanu drawing dead in the hand. 3rd Place, Giovanni Safina, $120,000. Safina pushed all-in holding Ac-7s and Schwartz called with Kc-3c. The board came 5s-Qd-6d-Js-3d, giving Schwartz a pair of threes and sending Safina to the rail in third place. 2nd Place, Luke Schwartz, $200,000. Schwartz, despite starting the heads up battle against Benyamine with a sizable chip advantage, was dispatched in rapid fashion and sent to the rail in second place. The final hand of the tournament came when the two players got all-in after a flop of 5s-3c-Qs. Schwartz held Qd-2s, while Benyamine held Qs-8d. The turn and river didn't help Schwartz, and Benyamine was declared the winner of the event. With his victory, Benyamine joins the likes of J.C. Tran, Andy Black and Juha Helppi as "Party Poker Premier League" champions. David Benyamine now has a little under $4 million in lifetime tournament cashes thanks to this win.